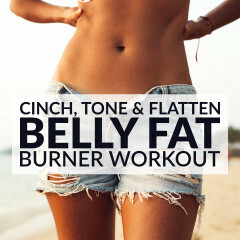 Cinch your entire core and get your tummy slim and tight with this at home bikini abs workout. Complete this sequence once a week and maintain a healthy diet to achieve a firm stomach in no time! Bikini season, here we come!!! Start this bikini abs workout with a metabolism booster warm up routine. 1. Run in place: 60 seconds. Open your chest, pull your knees up and land softly on the balls of your feet. 2. Frog crunches: 45 seconds. Lie down on the mat with your back flat, your hands supporting your head and lift your legs to a 45-degree angle. Lift your shoulders and bend your knees, bringing them toward your elbows. 3. Pulse ups: 60 seconds. Raise your legs to a 90-degree angle, lift your hips and hold for 2 seconds. 4. Standing side crunches: 60 seconds. Stand up, shift your weight to the left leg, bring your right knee up toward your elbow and crunch. Switch legs and repeat. 5. Plank leg lifts: 45 seconds. Start in a low plank position, lift your left leg to a 45-degree angle and hold for 2 seconds. Switch legs and repeat. 6. Superman: 60 seconds. Lie on your belly with your arms and legs fully extended. Lift your arms and legs off the floor, and hold for a count of 2. 7. Crunches: 60 seconds. Lie on your back with your knees bent, your back and feet flat, and your hands supporting your head. Lift your shoulders, squeeze your abdominal muscles and hold for 1 to 2 seconds. 8. Seated knee tucks: 45 seconds. Sit with your hands on the mat, your legs fully extended and lean back. Bend your legs and bring your knees toward your chest. Hold for a second or two, and then fully extend your legs without touching the mat. 9. Wood chop: 30 seconds + 30 seconds. Stand up and hold a dumbbell with both hands. Rotate your torso to the right and raise the dumbbell until it’s over your right shoulder. Squat as you rotate your torso to the left, and bring the dumbbell diagonally across the body until it’s close to your left hip. Repeat for 30 seconds and then switch sides. 10. Plank jacks: 45 seconds. Start in a push-up position with your feet together. Hop your feet as far as you can and land softly on your toes. Hop again and bring your feet together. Finish this bikini abs workout with a set of static stretches. 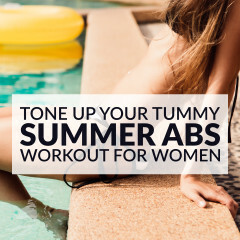 Cinch your core & get your tummy slim & tight with this at home bikini abs workout!